Ever since Froogle got the boot from the Google homepage, there has been a need for exposure for the service. 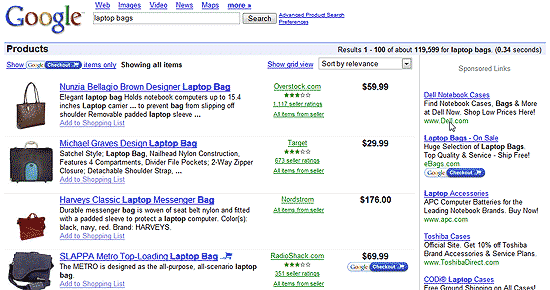 As Google Checkout picks up steam, the natural place to promote merchants offering Checkout is Product Search. This may be the way Google is trying to get more traffic through to the price comparison engine. So, does anyone else think the merchants offering Google Checkout get a huge advantage? Is this good for consumers? Is it good for merchants (regardless if they offer Checkout, PayPal, or neither)? Or, is the tactic slightly… “Microsoft’ish”?